The Kona is situated at Antechamber Bay 25 Kms east of Penneshaw on 3500 acres of 1820's historical coastal farmland, 'Creek Bay'. The Kona is a modern, open-plan beach house suitable for up to two families. Unwind on the large entertaining deck, prepare meals in the modern kitchen or travel a short distance to local eateries in Penneshaw. Creek Bay farm adjoins Leseur National Park and is close to Chapman River. Enjoy secluded walks amongst native bush and coastline, including over 1000 acres of private bushland. 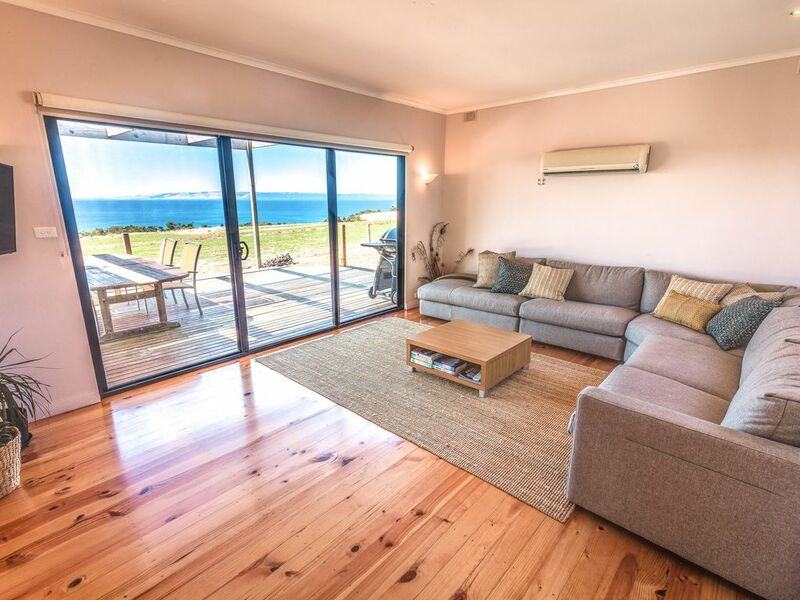 The Kona holiday house is situated 25kms east of the ferry terminal at Penneshaw. Go through the township and turn left past the Penneshaw school, the signs indicate Antechamber Bay and Cape Willoughby Lightstation. The road is sealed for the first part and then becomes dirt. After 23kms you will come to the Creek Bay Farm. Turn left and follow the road 2kms until you arrive at The Kona which is on your left. If there is any confusion about directions and/or location please do not hesitate to contact us! Beautiful spot and lovely home. Had everything you needed, including Pod Coffee!! Which was awesome! Gorgeous views and so peaceful and tranquil. The King size beds were so comfy! The only negatives were that the 3rd bedroom was very small with the 2 bunks and there were a few spiders and webs behind the beds.... and we hate spiders!! We also could not get the wall heater to work? Also, when it rained you could not sit outside on the deck as there was no coverage on the pergola. Only small things... would definitely go back there! Thank you for your review and constructive feedback we are so pleased you had a fantastic family time . I am sorry you didn't see the plug in induction hotplate in the cupboard. We had a wonderful time! The view is spectacular. The house is spacious and clean and perfect for a family. The lambs said hello to us every morning. Thank you Stacey we are so pleased you had a wonderful family holiday. it is a beautiful time to visit our property with an abundance of lambs and Kangaroos.